The most southern French region along the Atlantic coast, Aquitaine is ideal for those wanting to enjoy a traditional French atmosphere with beautiful villages and well preserved historic sites dotted throughout. Guests can enjoy golden sandy beaches, castles, pretty coastal villages and delicious French food and wine during an Aquitaine holiday. ... Read more Explore the countryside with its country estates and châteaux, tour the vineyards and sample silky French wines, wander through the old European streets of the towns or stop off in one of the bistros for a delicious taste of France. The beaches present golden sands, offering plenty of activities for everyone, and the woods are ideal for those wanting to explore, with pretty paths leading to romantic views and historic sites. With beautiful residences, villas and apartments to book, Madame Vacances offers something for everyone in Aquitaine. Families can enjoy the Résidence Les Rives Marines in Le Teich, while romantic villas for couples include the Villas La Clairière aux Chevreuils and the Villas La Prade, both located in the beautiful coastal town of Moliets. For four-star accommodation that will make you feel miles away from anywhere choose the Résidence du Château de Salles. One of the largest regions in France, stretching up to Bordeaux and the Dordogne in the North and down to Bayonne and the Spanish border in the south, Aquitaine is home to varied landscapes and beautiful towns. 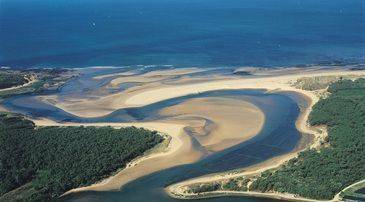 With 100km of coastline facing the Atlantic Ocean, the Aquitaine region offers sublime beaches. The famed stretch of the Côte d'Argent is situated just a short walk or a leisurely cycle from the Moliets village, and is sheltered by picturesque dunes, while lifeguards are present to keep an eye on proceedings. The Le Verdon Sur Mer resort boasts Soulac Beach along the Côte d'Argent. This beach offers a small, charming sandy beach with a slower pace of life, enjoyed by locals and visitors alike. There are shallow seawater pools, which are perfect for younger paddlers, and gentle waves for those just learning to surf. The seaside town of Mèdoc provides an ideal post-dinner stroll along the shoreline, stretching from the top of the Bay or Archachon. From Le Teich, guests can enjoy a trip to Bird Island. Only accessible by boat, this former sand dune is a bird reserve that sees hundreds of migratory birds roosting there, as well as unique flora and fauna, visiting oyster fishers and yachtsmen. For something more high energy, the Atlantic coast boasts a variety of water sports, including sailing, body boarding, rafting, canoeing and diving. Those wanting to take their PADI course will find plenty of centres available here. Beaches in Les Landes offer some of the finest surfing beaches in Europe, such as Cepbreton, which hosts regular surfing competitions for experienced surfers. In the Mèdoc region, Soulac, Lacanaou and Montavlivet all offer good surfing, with facilities to hire equipment and book lessons available. For something a little different, the lakes at Laconaou and Hourtin-Carcans offer beautiful warm swimming and more relaxed water sports, with sandy inland beaches, which can be reached by bicycle or car from the Aquitaine beaches. Cyclists and walkers will be spoilt for choice in the beautiful Aquitaine region. The north is home to large vineyards and small farms and woodlands perfect for exploring, while the south is home to thick pine forests, heath and farmland. Wander along the coast or through the dense trees, exploring this stunning area at your own pace, remembering to stop off for a rustic French picnic! History lovers will find prehistoric sites around the Lascaux area, where there are fascinating caves with Palaeolithic paintings estimated to be up to 20,000 years old! Many of these caves are UNESCO world heritage sites, and identical replicas have been created for visitors to see, without fear of damaging the originals. St Emilion is a small historic city worth exploring for its beautiful monolithic church and bell tower, king's tower, convent and palace. The capital of the region, Bordeaux, is home to an amphitheatre, the beautiful bridge over the River Garonne, picturesque streets and the Place de la Bourse. As with any holiday in France a trip to Aquitaine involves plenty of delicious regional food and wine. 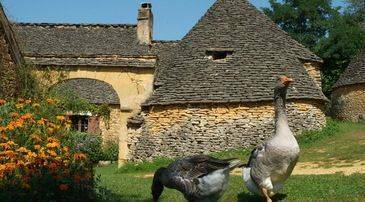 The home of world renowned delicacies such as foie gras and duck confit, as well as Perigord truffles, a visit to Aquitaine will excite everyone's taste buds. The land throughout the region is rich in agriculture, bringing its visitors delicious organic, locally sourced ingredients. Aquitaine's coastal areas offer a fantastic range of fresh seafood and fish, especially the locally caught world-class oysters from the Bay of Arachon, while the farms are home to award winning cattle farmers providing Blonde d'Aquitaine, as well as a delectable range of cheeses. The town of Bayonne holds yearly chocolate and ham festivals held in May and April respectively. Home to a wonderful range of restaurants even those travelling on a shoe string budget can enjoy fine French dining in the area in rustic bistros and brasseries. With its Bordeaux capital, Aquitaine naturally presents excellent wines throughout the region. With so many vineyards, there are many chateaux to visit, with wine tasting leading to the opportunity to buy wine direct from the growers. Madame Vacances offers visitors the best of the Aquitaine region, with a wide range of properties available. Stretching across a fascinating landscape, with the mountains, cities, beaches and beautiful countryside on offer, Madame Vacances brings you the best selection available of Aquitaine holiday rentals. Le Teich is home to beautiful salt marshes, bringing with them fascinating birds, flora and fauna, as well as delicious fish caught straight from the sea, plenty of water sports and golden beaches galore. Choose the Résidence Les Rives Marines for access to this stunning area, with spacious self-catered apartments that are ideal for guests wanting to enjoy the many markets and restaurants of the area. Moliets enjoys an incredible stretch of beach, with pretty estuaries and coastal villages to explore in the surrounding area. Here visitors can fully relax on the sands of the beach, or wander through the lush green landscapes. Résidence Du Golf provides a swimming pool, as well as offering guests easy access to one of the best golf courses in France. The Landes forest and beach are within easy access as well. Villas Club Royal Ocean 17 is perfect for families, with lots of activities nearby, while Les Appartements et Maisons de Moliets combines family friendly activities and golf. Guests wanting to enjoy easy access to the vibrant city of Bordeaux, coupled with beautiful landscapes and a gorgeous chateaux should book a stay at the Résidence du Château de Salles, where groups of four to eight can enjoy a relaxing or action-packed holiday in Aquitaine. Find the best Aquitaine accommodation for you with the French holiday specialists today.